Rollei has announced a 3D digital picture frame called Rollei Designline 3D. The 3D frame is 7″ in size and comes with software, Blaze Video Magic 3, that helps you convert your 2D images into 3D versions. You can also use the picture frame as an eBook-reader and it comes with stero speakers. The resolution of the Designline 3D is 800×480 pixels. The Rollei Designline 3D will be released in January 2011 and cost about €299.95. 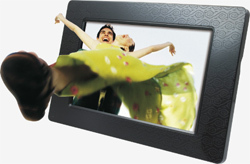 Rollei’s 7-inch Designline 3D digital picture frame draws its viewers into the third dimension and shows 3D pictures with a resolution of 800×480 pixels. It’s practical: The scope of delivery include the “Blaze Video Magic 3.0” software that helps to convert 2D images into 3D pictures or videos with just a few mouse clicks on the computer. It is possible to emit an AV-Out signal via TV cable. Besides its 3D function, the Designline 3D provides innumerable other features that go far beyond the performance of other digital picture frames. For example, the 16:9 frame plays MP3 files via integrated stereo speakers and has an E-book function. In slide show mode, there are seven different speeds to choose from for designing the transition effects. Thanks to an integrated rechargeable lithium-ion battery with up to 3 hours of runtime, Rollei’s 3D digital frame can also be used very flexibly in the room. The frame design with its black decorative pattern makes it a highlight – regardless of whether it is on a shelf, on the living room wall or travelling with you. It can be optionally operated with an infrared remote control or a touch menu, which only becomes visible when you touch the right edge of the frame.